With its wealth of child-friendly offerings and treasures that span the centuries and the globe (and beyond), the Smithsonian is the ideal destination for Washington-area families. Now, the Smithsonian Associates has a few surprises and sparkling new events in store for both kids and adults. We've listened to families who've asked to make it easier to enjoy a Smithsonian experience by offering performances on weekends and holidays, and special programs and activities where the whole family can take center stage. Imagine rolling out your sleeping bag beneath a 50-foot whale, at the home of the Star-Spangled Banner, or in the shadow of the space shuttle Discovery. That’s exactly what kids and their grown-up companions can do when they attend a Smithsonian Sleepover. The American History Museum, Natural History Museum, or the Air and Space Museum’s Udvar-Hazy Center are all yours during a night of fun that features tours, games, crafts, and more. Which adventure will you choose? Who it’s for: Children ages 8–12 accompanied by an adult for Natural and American History Sleepovers. 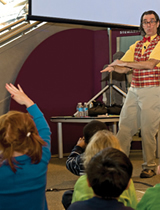 Children ages 8–14 accompanied by an adult for Udvar-Hazy Center Sleepovers. Learn more about the Sleepover activities and what to bring at SmithsonianSleepovers.org. Know any future astronauts, animators, astronomers, actors, artists—or zookeepers? They’d love the Smithsonian Summer Camps. Choose from more than 80 full-day camps that invite kids to expand their knowledge and hands-on skills in a whole spectrum of fascinating topics. All of the Smithsonian becomes Washington’s coolest learning lab as campers pursue their favorite interests and develop new ones. Who it’s for: Camps are offered for children entering K to grade 9; each camp has a designated grade range. 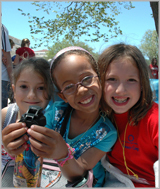 Learn more about this year’s camps on the Summer Camp website. Discovery Theater is the perfect place to introduce the youngest Smithsonian kids to live performance, music, and movement. Grade-schoolers will find much to enjoy in original productions and programs that use theatre to connect them to new ideas, places, people, and skills. Stories of adventure, history, exploration, and science come alive in Discovery Theater’s signature mix of learning and entertainment. Discovery Theater programs are great for both school groups and families. SPECIAL SERIES: For ages 2-6, Discovery Theater's TOT ROCK performances feature rockin' dance party concerts with music by some of the hottest bands and performers on the kids' scene. Who it’s for: Children ages 2–11; an appropriate age range is provided for each show. When it happens: Discovery Theater’s season runs from September through July. We’ve got amazing programs for young people all year round. Smithsonian Associates’ family programs make the Smithsonian the place for kids to play and learn. They offer smart choices—in every way—for families looking for engaging and affordable ways to expand young peoples’ horizons and spark their imaginations.